Malign Sorcery is by far and away our favourite change in the new edition – it’s an expansion that takes magic and turns it up to 11. Every single one of these spells, along its warscroll card, is in the box. It’s your one-stop shop to a new age of magic, and that’s not even all! Inside the Malign Sorcery box, you’ll find the full Malign Sorcery supplement – your guide to magic in the Mortal Realms. This book takes a closer look at magical lore in the Age of Sigmar, and the arcane materials that accumulate in each realm, such as Aetherquartz and Cyclestone. There are pages of spectacular new art and background depicting the unbound living magic rampant across each of the realms. 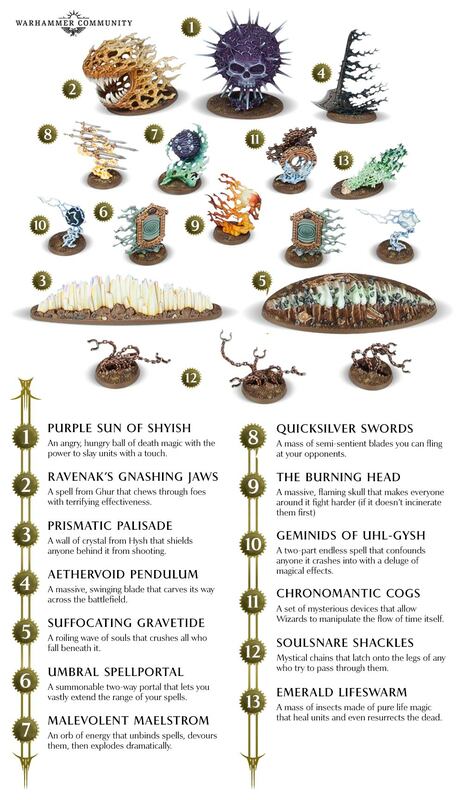 You’ll even find painting guides for many of the endless spells, to help you get them ready for your own games.